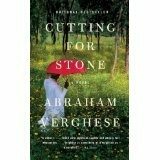 To start the New Year off with a bang, the book club choice for January was Cutting for Stone by Abraham Verghese. A few friends loved it and raved about the book. Anxious to dig in, I jumped on to download the book to my kindle. Glancing briefly at the star ratings on the book, I was impressed, all 4 and 5 stars. Not to excited about 690 pages, but it can be done. I don’t understand all the great reviews. Books and writing are like any other creative art, very subjective. What one person likes, the next may not, it is all personal preference. This book is just not my cup of tea. The author, Mr. Verghese is a professor at Stanford University’s School of Medicine and holds a Master’s in Fine Arts. Cutting for Stone is the story of twin brothers who are orphaned in Ethiopia and their struggle to come of age in a poverty stricken country. With Mr. Verghese’s medical background the book is full of medical terms and medical situations while intertwining the lives of the people. By the time I reached page 152, I threw in the towel. Call me a quitter, I will take the hit on this one. My motto is this “Life is too short to waste time reading a bad book.” I just couldn’t cut through 690 pages. Obviously, I am one of the very few who didn’t find this book to be a masterpiece. My recommendation to you on this one, read at your own risk. If you love the medical side and can find your way through the terms, maybe this book is for you. Moving on to the next great read, I will see you back here for the next book.